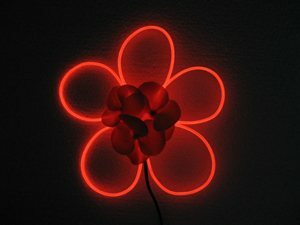 These amazing flowers glow. Each one is unique, handcrafted by artists in the USA. The petals are bendable, so you can modify the flower anytime. They have a small battery pack attached to the flower that holds one AAA battery inside. The battery is not included, but can be easily replaced without tools. The flower and battery pack each have a locking pin on the back to attach them to your clothes or hair. Light weight, only about one ounce. The round petal flowers are 6 inches from tip to tip. You can bend the petals to other shapes. The centers are made from a variety of materials including silk flowers.